Blastomycosis is a chronic infection characterized by a granulomatous and suppurative lesion. 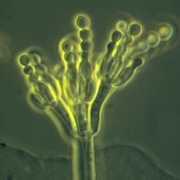 It is caused by a single fungal species, blastomyces dermatitidis, which is a thick walled spherical yeast that usually produces single buds. The bud and parent yeast have a characteristically wide base of attachment. The infection is initiated by inhalation of the dimorphic fungus. Dissemination may occur to any organ from the lung, but preferentially to the skin and bones. Blastomycosis is endemic to eastern parts of the United States but is also seen throughout Canada and Central America. The natural habitat of B. dermatitidis is unresolved. Isolates have been found in the soil from barns, a chicken house, a cattle crossing, and abandoned shacks. Although animal- to- man transmission has not been identified, canine blastomycosis is common. The endemic area extends roughly east from states that border the Mississippi river. In particular blastomycosis is endemic in the southeast, Ohio valley and Illinois. Blastomycosis is at least 6 times more common in men and typically effects middle- aged patients. Most infections with blastomycosis are probably subclinical and resolve spontaneously. Nearly all cases originate in the lung and when looked for residual pulmonary lesions can be found. In the alveoli, these organisms induce an inflammatory response characterized by infiltration of both macrophages and neutrophils and the subsequent formation of granulomata. The presence of calcification, however, is rare. Unlike tuberculosis and histoplasmosis, blastomycotic lesions rarely caseate or calcify. Two basic forms of blastomycosis have been recognized: pulmonary, often disseminated, blastomycosis and the chronic cutaneous form. Presenting complaints include cough, weight loss, chest pain, skin lesions, hemoptysis, and localized swelling. In some patients the initial pulmonary infection presents symptoms of mild respiratory infection. Hematogenous, lymphatic, or macrophage- bore dissemination occur. Pulmonary involvement occurs in approximately 60%, 35% have involvement of both lung and skin, whereas 19% have infection of skin only. In some patients the pulmonary focus becomes more severe and is accompanied by pleuritis. Forms of lung involvement include infiltration, cavitation, and nodules. The upper lobes are the predominant sites for cavitary, mass- like and fibronodular infiltrates which are characteristic of chronic blastomycosis. Because of the tremendous variation in symptomatology, blastomycosis is quite often misdiagnosed as some other infection. Dissemination occurs to the genitourinary tract, skin, liver, CNS, spleen, bone, lymph nodes, heart, adrenals, GI tract, and pancreas. 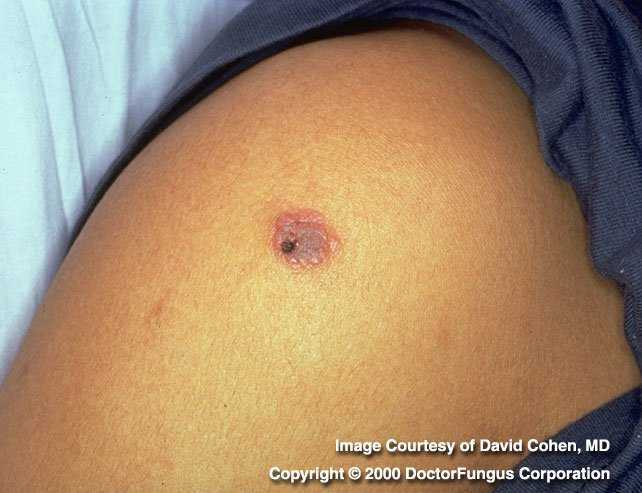 In chronic cutaneous blastomycosis the initial skin lesion presents as one or more subcutaneous nodules that eventually ulcerate. They are most common on exposed skin such as the face, hands, wrist, and lower leg. 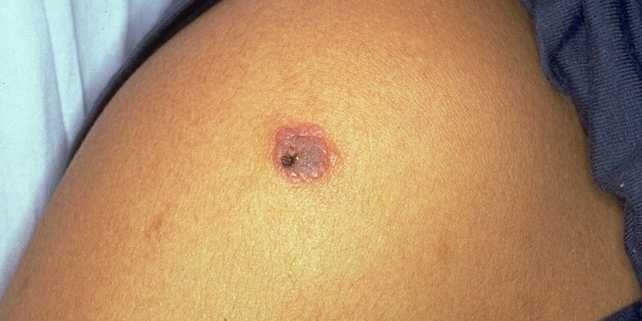 If untreated, elevated granulomatous lesions with advancing borders develop. Verrucous epithelial hyperplasia overlying the yeasts may develop. Overall, skeletal involvement has been reported in 33% of patients. Osteomyelitis and arthritis may occur. Because the frequency of bone involvement is so high, an extensive radiographic examination is advisable upon diagnosis of blastomycosis. Diagnosis is usually made by direct culture, KOH preparations, special stains, and measurement of complement fixing antibodies to various antigens. At this time no reliable skin test is available. Treatment involves the use of 2- hydroxystilbamidine and amphotericin B. A good clinical response has been found with use of both drugs. Ketoconazole is currently being evaluated as a primary or secondary treatment modality. In higher doses and for longer periods of time, ketoconazole will probably be efficacious. Response to treatment tends to be good. The prognosis for chronic cutaneous blastomycosis is considerably better than that for systemic disease. Mitchell, T. Blastomycosis, in Feigin and Cherry, eds. Pediatric Infectious Disease, p. 1927. Chessney, J. Pulmonary blastomycosis in children. AJDC 133: 1134, 1979. Cush, R. Clinical and roentgenographic manifestations of acute and chronic blastomycosis. Chest 69: 345, 1978. Edson, R. Treatment of primary pulmonary blastomycosis. Mayo Clin. Prac. 56: 683, 1981.